Do you love spaghetti, penne or mac and cheese? My friend Karen from Nutrilicious and I sure do, well really who doesn’t love a good noodle. Which is why we thought why not try of some of the new pastas that are showing up on grocery shelves. It use to mean a trip to the health food store to find gluten-free and alternative pasta options. Not any more, now you can find noodles made with chickpeas, lentils, black beans and I even spotted a box of edamame spaghetti. The good news is most are packed with protein but also low on carbohydrates. Explore Cuisine’s black bean spaghetti has 23 grams carbs, 24 grams of protein and 11 grams of fibre per 2 ounce serving. When shopping for gluten free pastas read the back of the box, I noticed that some brands base the nutritional values on 2 ounce serving and some on 3 ounce serving. Now the fun part, eating the pasta! The pastas did hold up well with the sauce, but yes you do have to get use to the chewy and dense bite of the noodle. 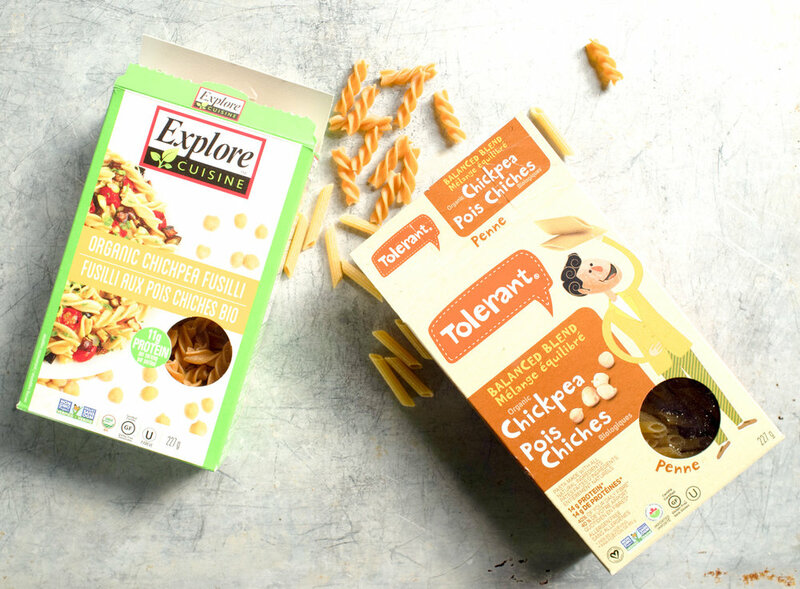 I did enjoy both the Tolerant Organic Chickpea Penne and the Explore Organic Chickpea Fusilli, but if I were to buy again I would go for the penne, but that’s because any penne is my go to pasta. Both the black bean pastas are a good choice too, and they make for a dramatic presentation. Though have fun getting members in your family to buy into black pasta, (I thought it looked purple). For the record my in house taste-tester Gordy was not sold - just give me a bowl of white spaghetti! 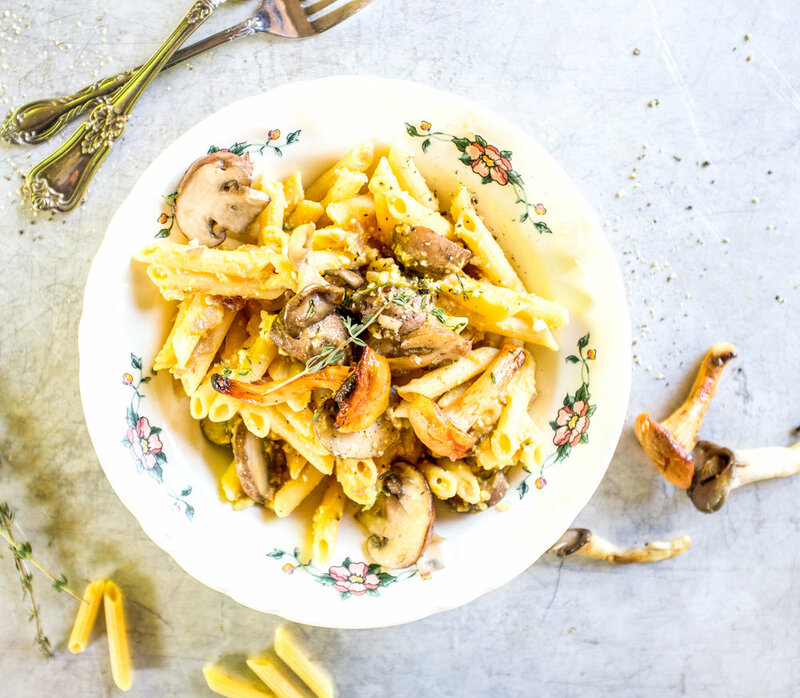 It is challenging to correctly cook gluten-free pasta. My best advice is to start tasting for doneness a few minutes before the recommended cooking time. And do not make that pasta in advance, have it ready for when you are ready to eat. Do not rinse the pasta, just drain and add it to the sauce, and save a bit of the pasta water so you can add a splash to the sauce. 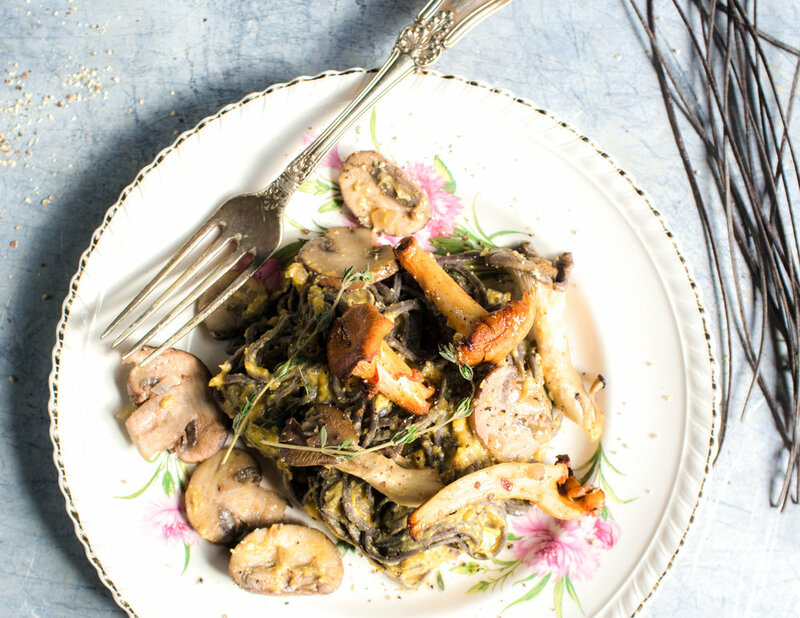 These alternative pastas are not exactly like regular spaghetti, but they make great substitute and are a healthy, alternative to regular pasta. So go ahead and get your pasta fix and eat your noodles. 1. Soak the cashews in hot water for 15 to 30 minutes or until soft. 2. Blend the cashews, pumpkin puree, vegetable stock and salt in a blender until smooth and creamy. 3. Cook the pasta according to the package directions and drain, saving a cup of the pasta water. Do not drain the pasta. 4. In a large non-stick pan heat the oil over medium-high heat. Add the mushroom and cook until golden brown. Remove to a plate then cook the shallots, garlic and thyme until soft and transparent. Add the mushrooms back to the pan and sprinkle with salt and pepper. 5. Add the pumpkin sauce mixture to the pan with the mushroom. Toss in the pasta, reserving some mushrooms to decorate the top. Sprinkle over some fresh chopped parsley and more salt and pepper. If the sauce is too thick add a bit of the reserved pasta water to thin out.